Avocados are one of the tastiest foods on the planet. Without them guacamole, a staple food in many parts of Latin America, and certainly one of my all-time favorites, just wouldn't be possible. But that's not why we grow them at Finca Cazador. We grow them for the outstanding health benefits. 1) Avocados contain over 20 vitamins and minerals. 2) They contain 25 milligrams (in every ounce) of a natural plant sterol by the name of beta-sitosterol. This ingredient has been show to help reduce bad cholesterol. 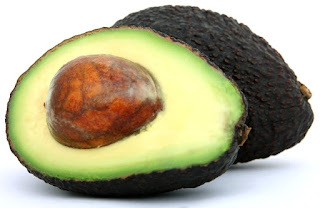 3) Avocados contain lutein and zeaxanthin, two phyto-chemicals that are especially concentrated in the tissues in the eyes, where they provide antioxidant protection to help minimize damage, including from ultraviolet light. 4) A half and avocado contains 25% of the daily requirement for vitamin K, which is helpful in the body's absorption of calcium. Eating an avocado a day may help reduce the risk of developing osteoporosis. 5) Avocados contain folate. Adequate intake of folate from food has shown promise in protecting against colon, stomach, pancreatic and cervical cancers. Foods containing high levels of folate may also help decrease the risk of depression, as folate helps to prevent the build-up of homocysteine, a substance that can impair circulation and delivery of nutrients to the brain. Excess homocysteine can also interfere with the production of the serotonin, dopamine, and norepinephrine, which regulate mood, sleep and appetite. 6) Despite its creamy texture, an avocado is actually high in fiber, with approximately 6-7 grams per half fruit. Eating foods with natural fiber can help to prevent constipation, maintain a healthy digestive tract and lower the risk of colon cancer. So, now how do you feel about avocados? If you would like to find out how you can purchase your own small organic farm in western Panama and grow avocados and other fruits and vegetables (not to mention organic coffee and cacao) for your own consumption or to sell, use the contact form at the top of the page and get in touch with us.